Regular readers will know that Kit Yamoyo, which we designed and distributed through the ColaLife Operational Trial in Zambia (COTZ) did a great job of applying design thinking to make Oral Rehydration Salts easier for mothers to use in their home. We put a lot of effort into understanding the needs and circumstances of carers looking after young children – and it paid off. Our final survey showed that 94% mothers/carers who used Kit Yamoyo mixed the ORS correctly. On the other hand only 60% of people get the mixing right when given a 1 litre sachet. The reason for this is that the Kit Yamoyo packaging acts as a measure for the 200ml of water needed for the smaller ORS sachets the kit contains. Although we did quite well with the vital micro-nutrient, Zinc, which goes along with ORS as the ‘gold standard’ diarrhoea treatment, we can do better. Yes, we did manage to get combined ORS and Zinc to 45% of children in our trial areas – up from a baseline of under 1% when we started. But our final survey showed that the adherence to the Zinc regime in the trial was not as high as it could be. Only 33% of care-givers actually continued to give their children Zinc pills for the recommended 10 days. 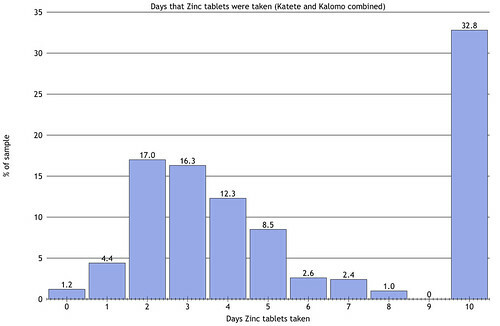 The graph below shows that most care-givers gave Zinc for the duration of the diarrhoea and then stopped. 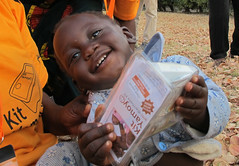 Actually, even a few days of Zinc will really help a child to get over diarrhoea and can protect them for up to 3 months. But 10 days is best. So, the question is, can we use good design to increase adherence to Zinc? This was a question Simon posed on the blog back in Sep-13. Many people dived in with suggestions and one company – Prime Decision – offered to look into this in detail on a pro bono basis. This artwork is now with our pharmaceutical partner – Pharmanova – for consideration. The next step will be to incorporate their feedback and get the design approved by the Zambia Medicines Regulation Authority. Of course, none of this would be possible if Pharmanova hadn’t been inspired by its involvement in the trial to manufacture its own Zinc here in Zambia. Ramchandani, R. et al. (2014). 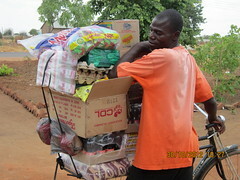 ColaLife Operational Trial Zambia (COTZ) Evaluation. Johns Hopkins Bloomberg School of Public Health, Baltimore. Related correspondence should be sent to Rohit Ramchandani (roramcha@jhsph.edu) and copied to Simon Berry (simon@colalife.org). I use adherence/compliance as one of the greatest achievements of ColaLife to date. We have worked on compliance in the pharma industry for 30 years as it is the final step in the process of delivering the product to the consumer and if it fails there, all steps in the process have been wasted. So I can’t understand why some organisations are still promoting 1 litre packs.